Cambodia is preparing to crown its new king, amid an array of official festivities. King Norodom Sihamoni, a former dancer, was chosen to succeed his father Norodom Sihanouk after he announced his abdication earlier this month. The main streets in Phnom Penh have been adorned with Cambodian flags and portraits of the new monarch. The government has also declared a national holiday on Friday in honour of the coronation. The royal family had asked that preparations for the ceremony be relatively low-key. But even so, Cambodians are looking forward to an eventful few days. Thursday was the first of three days of festivities to mark the official handover. At the Royal Palace in the centre of Phnom Penh, King Sihamoni took part in a ceremony which had both Buddhist and Hindu elements. Flanked by family members, the new king lit incense, bowed three times and placed chains of jasmine flowers on a special pillow. Eight white-robed priests made offerings of fruit and flowers to the heavens, according to a palace official. "On this very auspicious day... may all divine spirits guarding the throne bless his majesty, King Norodom Sihamoni, with a healthy and long life," said palace astrologer Din Prohm. The finishing touches have been made for the main enthronement ceremony. A huge portrait of King Sihamoni has replaced one of his father and mother in front of the palace gates, and buildings have been festooned with banners. The succession process began earlier this month, when former King Sihanouk abdicated due to ill health. There was no legal provision in the event of a monarch's abdication, and laws had to be rushed through parliament to enable a throne council to convene and choose a successor. 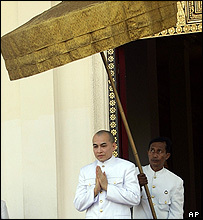 It soon became obvious, though, that King Sihamoni was the front-running candidate. One of his great strengths is the fact that he is seen as apolitical. While Cambodian kings used to have great authority, the position is now largely symbolic and wields no real power. Since he was announced as the new monarch just a fortnight ago, the nation's officials have launched a huge public relations campaign to inform Cambodians about King Sihamoni. He has spent much of his life outside Cambodia - as a ballet dancer and teacher, as well as Cambodia's ambassador to the UN cultural agency, Unesco - and is much less known than Prince Ranariddh, who heads the royalist political party Funcinpec. Former King Sihanouk, in contrast, is widely known and revered after 60 years on the throne. He is still likely to remain influential even after his son is officially inaugurated, and the Cambodian government has already declared that he will be known as The Great Heroic King Sihanouk.